Boston Pride Week's signature event is happening today. The 48th annual Pride Parade kicks off Saturday at noon in Copley Square and runs through the South End before ending at a festival on City Hall Plaza. Organizers are expecting half a million people to show up to the parade. They are planning to welcome more than 300 organizations to the parade, and there will be participants of all ages. Anywhere from 75 to 125 mayors are expected to walk with Mayor Marty Walsh in the parade. The event gets bigger and bigger every year, as organizers continue to add more events and things for people to do. "It gets bigger and bigger every year," said Kevin Horn who was planning to watch the parade Saturday. "It's really exciting to see how many people show up...and just the epic noise of the crowd." Martha Plaza, the pride chair who spends countless hours planning this event all year long, says it's worth every minute. She says the most popular spot to watch the parade is on Charles Street. Plaza adds Beacon Street is another great place because not too many people stand there, and they would like to see a few more spectators gathered in that area. "It's fun, it's loving, everyone's just excited to be here and be together," participant Jessica Smith said. "Our group is just like, how many colors can we get on our bodies?" "For a lot of people, this is a really important political statement. Just being who they are somehow becomes political, and so this is an opportunity for them to kind of own the street, and like it's their day, and that's really great," participant Josh Ledwell said. This year's theme is rainbow resistance, which carries huge meaning as it signifies the celebratory and activist origins of the event. "We've been fighting for many many years to gain equality in our communities, and we've made a lot of victories," Plaza said. "And unfortunately now those victories are at high risk of being pulled away from us. So the theme, which is voted by the community, is essentially a call to arms. It is a call for us to stand together as a family, to stand together strong, to stand together and really fight back and realize for everyone to say the fight is long, it's not over." 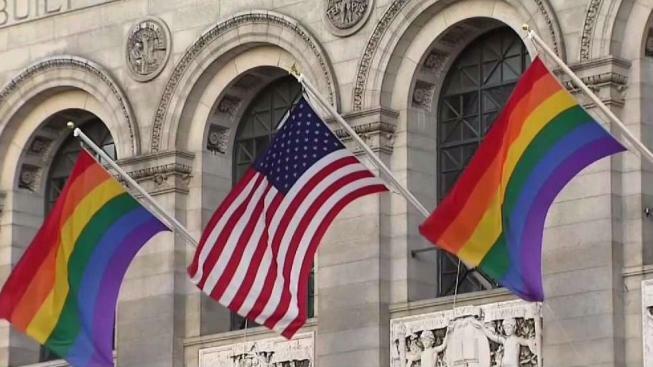 The Boston Pride Festival will be held rain or shine on City Hall Plaza from 11 a.m. to 6 p.m. The event is free and open to the public. Attendees are encouraged to bring sunscreen, plenty of bottled water and an umbrella or rain coat. The festival will feature a number of performances, exhibits and food options. There will be over 130 vendors, a Beer and Wine Lounge (for the 21+ crowd), and the Family Fun Zone (all ages are welcome). The Pride Concert starts at noon on the City Hall stage and will be headlined by Martha Wash, whose distinctive voice topped the charts as a member of the Weather Girls with "It's Raining Men," and Big Freedia, a New Orleans rapper whose voice can be heard on Beyonce's smash hit "Formation." Plaza says the concert is absolutely phenomenal and they encourage everyone to come down and have some fun while seeing a diverse selection of local and national headliners. Click here to see the lineup entertaining the crowds all day. Cambridge Street, City Hall side, Court Street to Sudbury Street** This restriction will also be in effect Sunday, as well as Saturday. The Boston Transportation Department encourages people coming into the city to refrain from using their personal vehicles. Attendees are urged to use the MBTA. You can check the MBTA website for schedules and routes. The weather Saturday looks mostly sunny with a high close to 80 degrees, so make sure you wear sun screen! While the Pride Parade and Festival are the marquee events, there will be plenty of other activities going on throughout the day. You can join the LGBTQ-friendly churches near the parade route for the 10 a.m. Pride Interfaith Services at Union United Methodist Church, and the 11 a.m. Pride Morning Service down the street at Old South Church. Click here to see a full list of Saturday Pride events.